"Hugh Ermen: 1928-2009 - was in his early eighties. Hugh raised many varieties of apples over the last twenty to thirty years that brought him considerable fame in fruit circles and with the wider public. 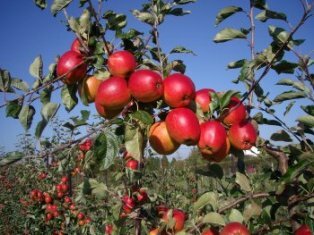 Red Devil was his first success, followed by Winter Gem, then Limelight, Herefordshire Russet, Scrumptious, Sweet Society and more, as well as two ornamental apples - Laura and White Star. 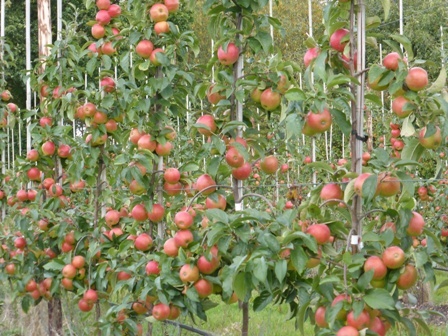 A number of these received the Royal Horticultural Society's Award of Garden Merit (AGM) in recognition of their value as superb garden apples for the amateur; being easy to grow with good disease resistance and heavy crops of handsome, well flavoured fruit. See: Fruit Forum for a more extensive appraisal of Hugh Ermen's career by Joan Morgan. 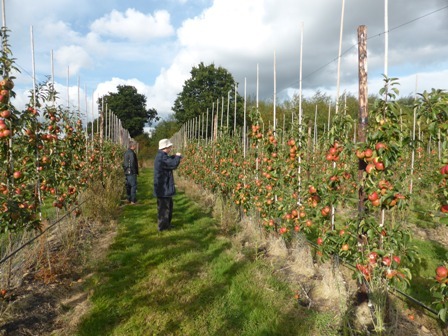 The English Apple Man has known John Breach for well in excess of three decades....buying apple trees from John in the early 1980's..........as well as being a highly successful agent 'providing' trees and stakes for our top fruit industry, John has been an amateur breeder. Enthused by Hugh Ermen, who passed a collection of seeds to John in the late 1970's. 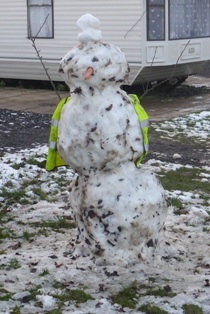 John has been quietly developing new varietal strains. Among his successes; NC1, NC2, NC3 & NC4 a red-skinned pear. 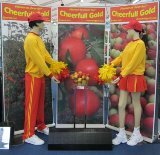 NC1 was named as NUVAR - Cheerfull Gold and launched in 2011 at The National Fruit Show. Raised by John Breach in Kent in 1979, from an open-pollinated Cox. A subsequent DNA test made in 2009 showed that the Cox had been pollinated by a Golden Delicious. Sainsburys have stocked Cheerfull Gold during its season (post Christmas) since 2013. It is also an award winner as an apple juice made by Owlet Fruit Juice as their Cheerfull Gold Juice was awarded a Triple Gold star in the Great Taste Awards 2016. Great Taste, organised by the Guild of Fine Food, is the acknowledged benchmark for fine food and drink. It has been described as the 'Oscars' of the food world and the 'epicurean equivalent of the Booker prize'. Quite simply the Great Taste logo is the sign you can trust when buying food and drink in your local, quality retailer. Launching a new variety - how does it all work? "Launching a successful new variety depends on several key factors. It must have visual and organoleptic appeal to the consumer; it must be an easy variety to grow and yield high levels of first class fruit and with the ongoing reduction of available crop protection chemicals, resistance to pest & disease is a sought after attribute. With these attributes in mind, John has raised two new varieties; NC2 an open-pollinated cross of Saturn x Braeburn made in 2001 and NC3 also an open-pollinated cross of Saturn x Braeburn made in 1999. 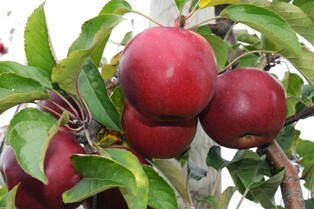 The parents bring specific attributes to their progeny, with Saturn's scab resistant gene mixed with Braeburn's propensity to deliver high yields of visually attractive fruit and excellent texture. The term 'open pollinated' means the pollination of the Saturn (in this case; the female) by Braeburn (in this case; the male) happened naturally with pollen from the Braeburn arriving on the Saturn flower by a carrier; a bee or another pollinating insect. The fact that both NC2 & NC3 have Saturn x Braeburn parents (even though they were pollinated in 1999 & 2001 is explained by the very close proximity of the Saturn and Braeburn trees. 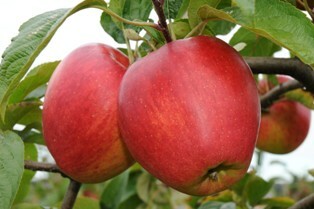 The Braeburn (male) parent was subsequently determined (proved) by a DNA test. Launching a successful new variety depends on several key factors. It must have visual and organoleptic appeal to the consumer; it must be an easy variety to grow and yield high levels of first class fruit and with the ongoing reduction of available crop protection chemicals, resistance to pest & disease is a sought after attribute. The 4,500 trees of CABARET and 10,000 STARDANCE planted in Kent are exclusive to Avalon Produce and form part of the continued development with Tesco. Michael Joyles of Avalon Produce Limited added "this continues the commitment and work with Tesco to deliver great products to delight the consumer and to bring new products to market. CABARET has been developed over many years of trial work and one that was identified by Tesco Technical Manager and Apple Master John Worth, who has once again overseen the project." John went on to say "CABARET is another fantastic innovation and forms part of our NPD pipeline in collaboration with Avalon Produce Limited and is certainly one to look out for in the future". CABARET was identified to fill a gap in the market, whilst providing the consumer with a fantastic eating fruit". On Wednesday 11th January, The English Apple Man joined a small group at Haymarket Media Group offices in London; our mission; to judge the entries for the 2017 UK Grower Awards. Organised by Horticulture Week one of the Haymarket Media Group Companies, The UK Grower Awards celebrate the best of UK horticulture. 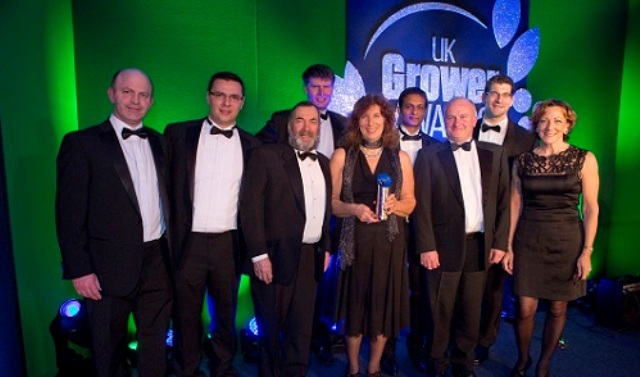 The UK Grower Awards is the highlight of the production horticulture year, giving professionals the chance to showcase their achievements, reward the efforts of staff and ensure potential customers know just how good they are. Our day of judging was organised by Kate Lowe, Editor of Horticulture Week and Grower Awards Manager Kate Collins. The Grower of The Year Awards Ceremony takes place at The Grand Connaught Rooms, London on Thursday 23rd February 2017.